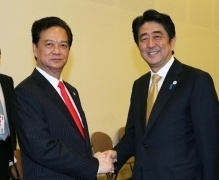 Japanese prime minister Shinzo Abe with his Vietnamese counterpart Nguyen Tan Dung following a summit meeting in October 2014. Tokyo and Hanoi strengthen their security and economic ties. Japan and Vietnam agreed to strengthen their extensive strategic partnership Tuesday during the Vietnamese Communist Party chief’s first ever official visit to Tokyo. Following a meeting with Nguyen Phu Trong, the General Secretary of the Communist Party of Vietnam, Japanese premier Shinzo Abe pledged that his country would provide new vessels and loans to Vietnam in a boost to economic and security ties. Abe’s new pledges are certainly a boost to the overall bilateral relationship. Security-wise, as I have written previously, to help strengthen Vietnam’s maritime law enforcement capabilities in the face of growing assertiveness in the South China Sea, Japan had already pledged to donate six used vessels to Hanoi during Foreign Minister Fumio Kishida’s visit there in August 2014 (See: “Japan Gifts Vietnam Patrol Vessel Amid South China Sea Tensions”). But on Tuesday, according to a joint statement released following the bilateral meeting, Abe pledged that more vessels were on the way. Specifically, a Japanese foreign ministry official clarified that the commitment is for two additional used vessels and related equipment as part of a broader 200 million yen aid package. The two countries also inked a memorandum of cooperation between their coast guards to enhance human resource development, as well as a document to boost defense cooperation in the field of United Nations peacekeeping operations. Turning to the economic realm, Japan is already the largest source of foreign aid to Vietnam and its second largest investor after South Korea. Abe deepened that cooperation even further this week by announcing that Japan would extend a 100 billion yen ($835 million) loan to Hanoi to advance its infrastructure development. The loans, Abe said at a joint press conference with Trong, will be for projects such as ports, harbors and highway development. This is in line with Abe’s initiative announced in May to provide $110 billion to promote quality infrastructure in Asia over the next five years (See: “Is This Japan’s New Challenge to China’s Infrastructure Bank?”). The joint statement also noted other economic initiatives. For instance, Japan has offered 286 million yen in official development assistance to help Vietnam build new general hospitals in Ho Chi Minh City. Vietnam will also open its market to Japanese apples, while Vietnamese mangoes will enter Japanese markets soon. At the press conference, Abe also directly mentioned the concerns shared between Tokyo and Hanoi over China’s actions in the South China Sea. “It is very significant that we shared grave concerns over continuous unilateral actions to change the status quo and increase tensions in the South China Sea, which includes large-scale land reclamation and building of outposts,” Abe said in a clear reference to Beijing’s behavior. This is Trong’s first ever visit to Japan since he assumed his position in 2011. In July, he made a much-anticipated trip to the United States as both countries commemorate the 20th anniversary of the normalization of ties (See: “US and Vietnam Should Boost Defense, Economic Ties, Says Communist Party Leader”). On his Japan trip, in addition to meeting with Abe, Trong’s official agenda includes a meeting with the Japanese emperor as well as well as business leaders before his trip ends on Friday. Move marks another ‘first’ in Japan-Vietnam defense ties.